Special Offers in the UK! 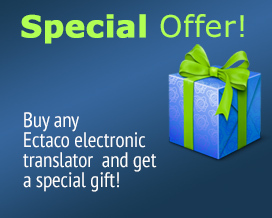 Buy ECTACO hi-end translator and get an Accessory Pack as an additional bonus! LingvoSoft translation software on sale! UK Sale Offers! Save now by ordering at our lowest prices! Plus get a free back-up CD and free shipping! Load all our dictionary, phrasebook and Language Teacher apps to your iPhone, iPod or iPad! Software Bundles feature some of our best products combined into complete collections. Each software bundle is grouped by language and/or platform. There is plenty to choose from! Select the dictionary or translation software package that suites your needs best and let computers take care of the “dirty work”. Buying an all-in-one package also makes sense financially. This section includes a number of dictionary, language-learning and other linguistic titles for Windows. Automatically translate documents, letters and files with machine translation software. Get a feel for handheld electronic dictionaries with dictionary emulators for Windows. Accelerate your language learning with our study aids. Enjoy your shopping! The largest and most expansive bi-directional dictionaries, phrasebooks and language learning software for all Android devices! With speech recognition, fluent pronunciation and the ability to learn languages, these apps perfect for any language enthusiast. No need for an Internet connection or 3G - the apps comes pre-loaded with everything you need for studying, traveling, or anything on the go. LingvoSoft software for Palm OS includes a broad range of dictionary and language learning software tools. Once you have a Palm handheld, it's time to pick the right software for it. This is where LingvoSoft applications come in. Whether you need help with one or more foreign languages, here you will find an efficient and affordable Palm solution. Here you will discover versatile and effective dictionary software along with language study aids and fun linguistic games. The software runs on Nokia and Sony Ericsson mobile phones. One or more of these quick-reference resources will surely become your go-to application in a variety of situations. Here you will find a wide variety of linguistic software for the Pocket PC platform. Empower your Pocket PC with the software you need! Choose from the many dictionaries, language learning programs, machine translation software, travel software, voice translators, and language support software that LingvoSoft has to offer.